For many of us, Anna is the most prolific food blogger who doesn’t blog and boy can she organise a food blog wankster get-together. Perhaps she is the elusive Helena Lewis that The Age keep referring to whenever they need ‘commentary’ from ‘food bloggers’? Naw, Anna’s far too adorable and is as consummate a cookie-foodie as she is an eatie one. It came time, she felt, to organise another beloved #duckfest and thus, Tristan and I were in attendance. 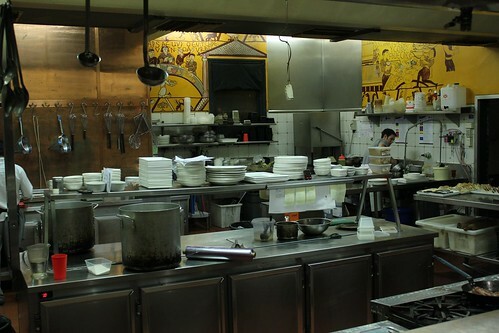 On this particular occasion, we were treated to the expertise of chef Paul Cooper at the Provincial Hotel in Fitzroy. I still remember the first #duckfest I went to that Anna organised. I am ashamed to admit that perhaps I did…let loose: did I really need an entire bottle of pinot with my duck? I still haven’t stopped being sorry to my fellow diners for my conduct though many were ridiculously gracious about the affair, bless. 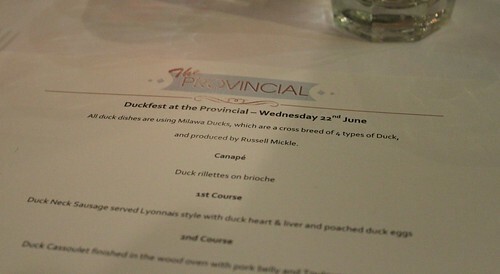 Lesson learnt, and this #duckfest was a good deal more formal with a tantalising four-course menu being put together for our delectation. Being unfashionably late and stuck in traffic, the canapé of duck rillette on brioche was politely set aside for me by Tristan and my table companions. Of course, it was scoffed down upon arrival. Our first official course was duck neck sausage, served Lyonnais-style with duck heart and liver, then finished off with poached duck eggs. Everything was perfectly balanced and so artfully arranged on the plate. 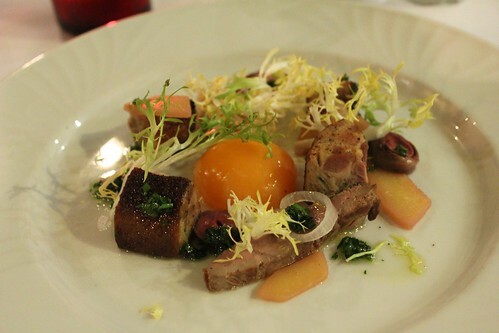 Surprisingly, a gooey egg yolk set off the gaminess of the duck and its related offal really well. What a thrilling start to our #duckfest! 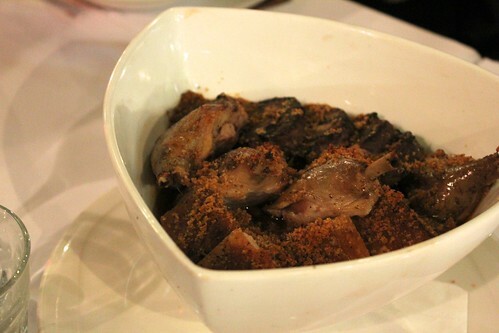 Our second course encouraged us to get our communal, interact-with-your-fellow-diners on: a bowl of duck cassoulet with pork belly and Toulouse sausage, finished in their wood oven. It was served in a deep bowl. Seasoned duckfester Billy volunteered to plate up for me, Tris and Bec, seated next to me. Of course, he did a stellar job of divvying up the dish for our quartet, as the photo below can attest. Not my first time having a cassoulet, having tried the one at Libertine in North Melbourne (which stands unreviewed but you can read reviews of two trips here and here) and also a top one cooked by eatie-cookie-foodie-academic Tammi, whose recipe can be found on her fabbo blog. Just the thing to stave off a cold, wet Melbourne winter evening. 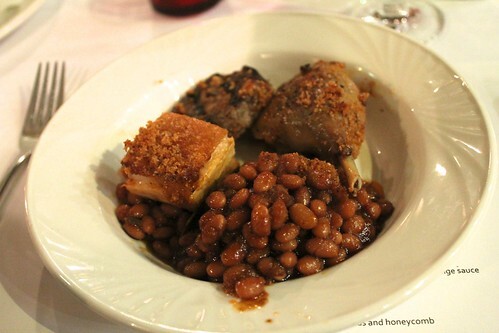 The duck and pork belly were deliciously crispy and the beans a perfect complement. And the best thing? There was enough for small second helpings! 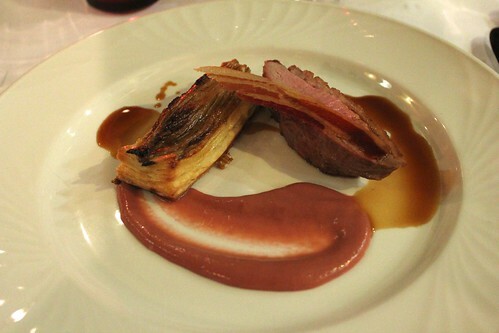 Slowly approaching being all ‘meated’ out, our last savoury course still needed to be fitted in: pan-roasted duck breast alongside a caramelised endive and bacon tart fine, finished with rhubarb purée and duck à l’orange sauce. Naturally, the duck was the star of the show but the tart! what a glorious accompaniment, especially with the slightly acidic sauces. It goes without saying, though I’ll say it anyway, everyone has room for dessert! 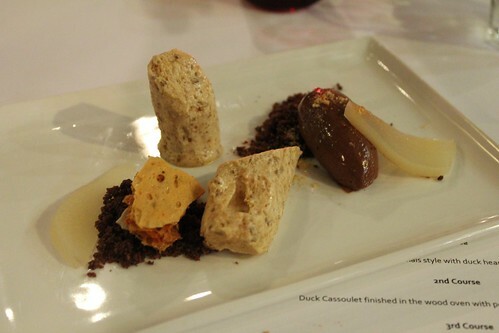 Our last course: pumpkin seed frozen nougat and chocolate mousse adorned with almonds and honeycomb. Yes, the duckiness has officially come to a close. A great close to a duckfest with a heavy French cuisine slant. As our party occupied more than one large table, not all of us got to talk to our fellow diners. 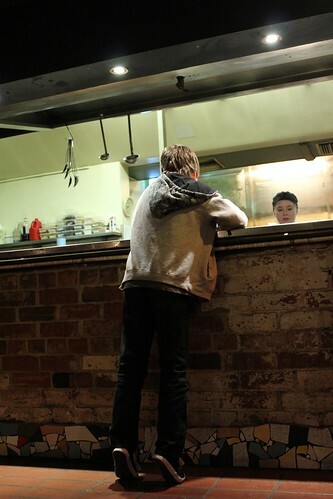 It was most heartening to see that one guest on another table had brought his young son – a food blogger in training perhaps? He’s perfectly happy to try and get some good ‘money’ shots! He probably got some good photos of the crew in medias res, but I like the calm after the storm too: no evidence of the frenzy that would have been preparing our delicious meal. Thanks again, Anna, our beloved duck enabler for organising a lovely ducktacular feast and here’s to the next one! Where will she choose for us, next time? 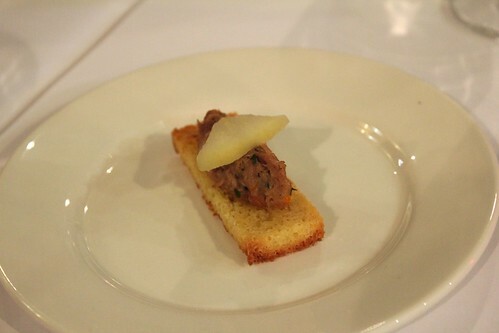 This entry was posted in eatie-foodies dining out, what has gone before and tagged cassoulet, duckfest, Helena Lewis, Milawa Ducks, modern Australian cuisine, Paul Cooper, The Age, The Provincial Hotel on August 10, 2011 by gem.